The greater part of three composite panels of grey limestone, moulded above and below. a) Seven blocks (together, 6.76 × height 0.51), from the central gable. b) Nine blocks (together, w: 8.44 x h: 0.52), from the left- hand gable. c) Eight blocks, from the right-hand gable. a) Lapidary capitals: l. 1, 0.125; l. 2, 0.08. b) Lapidary capitals: 0.145. c) Lapidary capitals: 0.145. Lepcis Magna: Chalcidicum, from the architraves of the central and lateral gables of the facade. Aurigemma, Africa Italiana (Rivista di Storia e d'Arte a cura del Ministero delle Colonie) 8 vols., Bergamo, 1927-1940 VIII:17.ff, fig 10, = text a); L'Année Epigraphique (Revue des Publications épigraphiques relatives à l'Antiquité romaine: annual supplement to Rev. Arch.) 1948: 7 and 8. This edition taken from J. M. Reynolds and J. 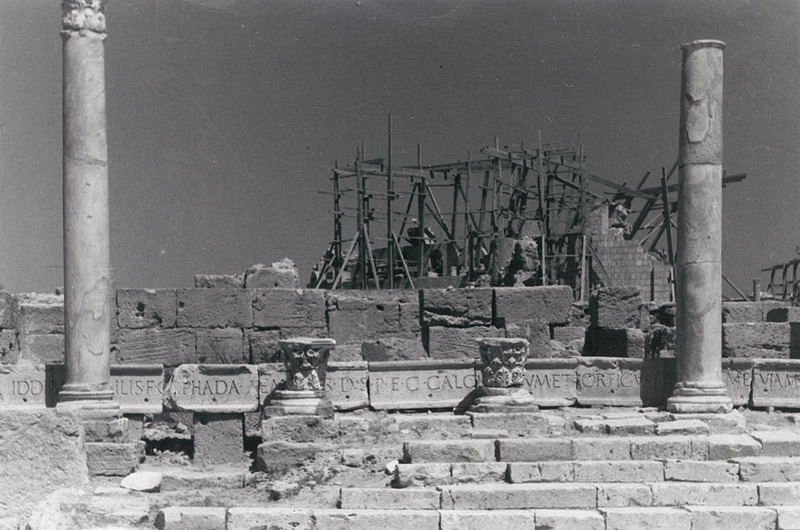 B. Ward-Perkins, The Inscriptions of Roman Tripolitania, Rome: British School at Rome, 1952.
b. Iddibal Caphada Aemilius, son of Himilis, saw to the construction of the calchidicum, porticoes, gate and street at his own expense. a) l. 1. trib. pot. XXXIIII - July 11 - 30 June 12.
a) l. 1. The chalcidicum and porticus are presumably the double porticoes of the court yard behind. a) l. 2. The XVviri sacrorum: probably a local college of priests; N. Degrassi, Epigraphica VII (1945) 6 ff.